At some time during World War II Exton apparently suffered a significant flood. The Valley Creek that runs along the road across from what was then The Exton Dairy Grill looks to have overflowed its banks. A Brandywine Farms truck navigates the waters along with two cars. My grandfather works on his signage while my mother looks on. 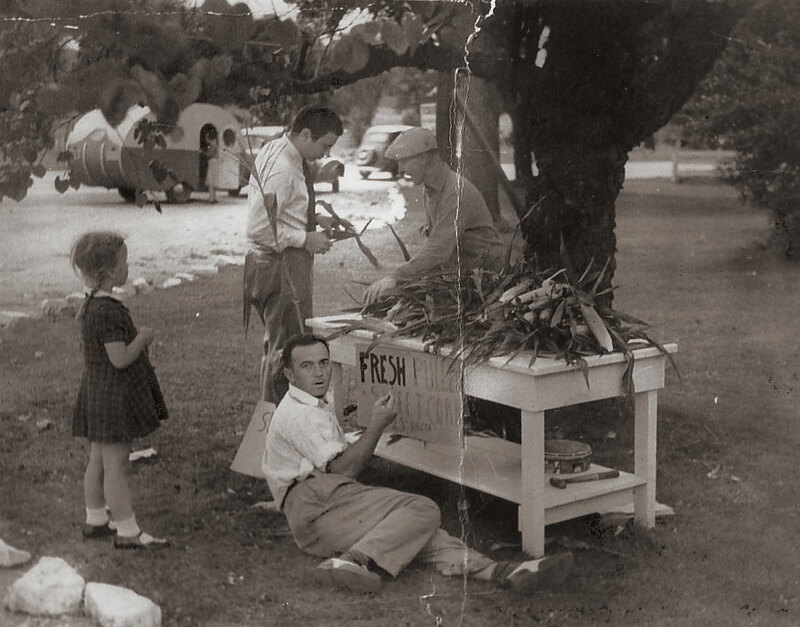 The makeshift produce table is set up on the lawn alongside Sleepy Hollow Hall on the west side of The Guernsey Cow parking lot. This was taken probably around 1940. Note: Years later — make that decades later — my siblings and I were hired by my grandfather to pick up rocks and gravel in that yard, filling many 5-gallon buckets. I don’t recall how much we earned; it was probably more than the 25 cents he was getting for a dozen ears back in 1940. But not much more. If you have photos of life around The Guernsey Cow, email them in to us at busboy@TheGuernseyCow.com. The Guernsey Cow, Exton, Pennsylvania Create a free website or blog at WordPress.com.